BELOIT, Wis. (November 6, 2017) – For the first time in company history, PlayMonster has been named a finalist for six Toy of The Year (TOTY) 2018 Awards, the industry’s highest achievement and one of its most revered accolades. The company garnered nominations across six different categories: Playset of the Year for My Fairy Garden Magical Cottage, Game of the Year for Ultra Dash, Doll of the Year for Wonder Crew, Specialty Toy of the Year for Mirari Juballees, Infant/Toddler Toy of the Year for Mirari Shellby, and Vehicle of the Year for Automoblox SC1 Chaos and HR5 Scorch 2-Pack. The six finalist nominations follow last year’s first-ever win for PlayMonster’s Yeti in My Spaghetti® for Game of the Year. In previous years, the company has earned at least one TOTY finalist distinction per year, so this year’s six is causing big excitement. PlayMonster was founded as Patch Products in 1985, and changed its name in 2016 to reflect the company’s continued commitment to provide play for all ages. The TOTY Awards are often referred to as the “Oscars” of the toy industry, and finalists were announced last week from a field of more than 600 nominations. 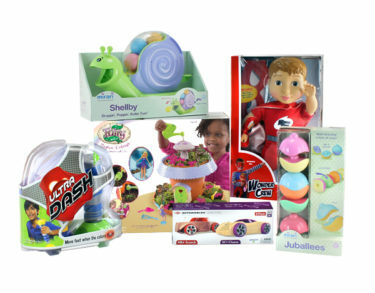 Finalists were determined by elite members of the toy industry, including retail buyers, inventors/designers, academics, journalists, trade media spokespeople and bloggers. For more information about PlayMonster’s TOTY Award finalists, click here to view the video and vote at playmonstervote.com. In late October, the Oppenheim Toy Portfolio honored PlayMonster’s Mirari Shellby, Automoblox and Ultra Dash with Platinum Awards, for the most outstanding and innovative products of the year. Industry powerhouse The Toy Insider featured Ultra Dash, Automoblox, Wonder Crew, Marbleocity and Mirari Juballees on their annual lists. The company has also received multiple awards from prestigious and recognized parenting organizations, including The National Parenting Product Award, Parent’s Choice Award and The National Parenting Center. The winners of the TOTY 2018 Awards will be announced on Friday, February 16, 2018, at the TOTY Awards Ceremony in New York City. The ceremony is considered to be the official kick off of the North American International Toy Fair, which takes place at New York City’s Jacob K. Javits Convention Center, Saturday, February 17 through Tuesday, February 20, 2018. Beloit, WI-based PlayMonster is a toy and game company that believes in the power of play to make a positive difference in people’s lives. Delivering great play value by designing, manufacturing and marketing innovative, fun products such as “TOTY Game of the Year” Yeti in My Spaghetti®, along with other award-winning toys and games like The Game of THINGS…®, 5 Second Rule®, Mirari®, Farkle, OK to Wake!®, My Fairy Garden®, Wonder Crew®, Automoblox® and Marbleocity® is how PlayMonster helps keep play alive for all ages.